PROTHERM, LLC builds high quality economical Flat Belt Conveyorized Ovens specifically designed for your application. We utilize rollers, parallel chains, flatwire, flex wire, Tef-glass mesh or solid belting to move your products through the infrared oven. Our conveyorized ovens are ruggedly constructed, typically with tubular steel frames. This gives you better quality than standard stamped sheet metal conveyors that some companies use, but not the overkill and extra weight of heavy structural steel or thick plates used by others. We take a common sense approach to the designs and keep it simple for installation, maintenance, and operation. Most insulated oven chambers have hinged or removable doors along the sides to allow full access. Heaters can be mounted to adjustable supports for easy heater positioning. This allows you to direct the infrared energy where you need it for greater efficiency. Product temperatures of 150 degrees F to 600 degrees F are common for PROTHERM, LLC Conveyorized Ovens, while higher temperatures can be achieved. We also offer cooling sections to our conveyor ovens to reduce the part temperature for handling. For the oven heat source, PROTHERM, LLC offers a variety of environmentally friendly electric infrared heaters, each with their own heating advantages and unique characteristics. All heaters are completely manufactured by Protherm, LLC, assuring you highest quality, proper use, and support for the life of the oven. Best of all, we will help you select the best heater for your process. PROTHERM, LLC ovens and control panels are built to be installed quickly, with a minimum of field wiring required. Most are completely factory assembled, set up and tested prior to shipment to assure a simple trouble free start up. 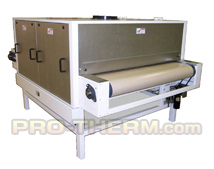 Protherm, LLC Flat Belt Conveyorized Ovens are widely used in manufacturing facilities throughout the world for a multitude of process heating applications such as laminating, bonding, curing, annealing, drying,and preheating just to name a few. Our sales engineers will gladly assist you with specifying a custom oven for your application.